ScottyP wrote: Sounds fun, I hope they get the engineering right. That "penny car" look into a somewhat normally proportioned robot can be tricky. I have two third party "MP" Cliffjumpers that drive this design concern. The first one I got was the MMC Ocular Max version which goes for the super deformed, tiny car look. It's not a mess to transform and the lack of a backpack is wonderful, but the rest of the resulting robot cuts a really odd looking silhouette. It was so bad I ended up getting the X-Transbots version which apes a good bit from MP-21 in the looks department - backpack and all - and it's spectacular. Toyworld pulled it off really well with their TW-03 BII and is a figure I've always wanted. So I have high hopes for what Takara can do. Well if the rumor is true, Bee will come with parts and accessories to pull off every one-off scene and a cartoon accurate Daniel/Spike. Personally, I'm torn. I want to see more of the original cast (Hound and Mirage, for example) represented, but I don't like this new aesthetic direction. I passed on TT Sunstreaker mostly because of his derpy-looking face, and I wouldn't buy that new Prime for even half of what they're asking. However, superdeformed alt-mode 'Bee intrigues me; I went nuts for the Toyworld and Newage versions, so I'll be keeping an eye on this story. I don't, however, feel a super-strong urge to push anyone to make this, though, mostly because I already have three versions of it (the aforementioned Toyworld and Newage figures, plus the original G1 guy). ... we make our voices heard through our wallets. Motto: "All we have in this universe is our word - so we should do our best to keep it." I've been edging away from masterpiece ever since the first rumblings of Prime v.3, but if this turns out to be true, I really will be done. Mirimus wrote: I've been edging away from masterpiece ever since the first rumblings of Prime v.3, but if this turns out to be true, I really will be done. I keep my eye out for MP Galvatron (someday) other than that, I just stick to the Beast Wars MP line. I don't think the rest of the line is worth it anymore. In as much as I collect lines that end, the G1 line most likely never will now. Which is pathetic, in and of itself. It's possible that the reboot presents a reduced need for licensing. While Bumblebee's animation model still looks a lot like a Volkswagen, the shift in styling might finally let them do characters like Cliffjumper, which doesn't actually look a whole lot like a Porsche. If this continues, I would not be surprised to see an updated seeker lineup and Bluestreak/Smokescreen/Prowl. Personally, I liked what we had been getting with a blend between real and cartoon, and the price of Prime 3.0 and the rumored price of Bumblebee 2 are a real turnoff and make this line even more difficult to collect. mentre83 wrote: I'm not into cartoon-accurate toys very much, as I prefer the additional detail of the first MPs. So for me, should this rumor be true, this is a "no". To me, this is the big takeaway. I wouldn't start thinking they're gonna re-do all the Masterpiece figures to totally match the cartoon, but getting the license from Porsche to do a Cliffjumper is probably never going to happen. Chibi "kinda-Porsche" might be the way to go. I do think Jazz is a slightly different case, but the ownership of Porsche/Audi/Volkswagen is a tangled mess, thus causing us to not have a Jazz by now. I'm guess the higher price is due to more parts to make it work (assuming it's not just a rumor, of course). The flaw in this trail of thought though, is the idea that licensing is the reason they are doing this. There are plenty of characters they could do without the need for licenses EG The Dinobots, The Insecticons, Reflector, Perceptor, Blaster ANYONE post-Movie. They simply don't care and this just gives them an excuse to reproduce the same characters they have already done with no further effort on their part at all. Likewise some fans don't care either and willing buy into this knowing they are being fleeced. AllNewSuperRobot wrote: The flaw in this trail of thought though, is the idea that licensing is the reason they are doing this. There are plenty of characters they could do without the need for licenses EG The Dinobots, The Insecticons, Reflector, Perceptor, Blaster ANYONE post-Movie. They simply don't care and this just gives them an excuse to reproduce the same characters they have already done with no further effort on their part at all. Likewise some fans don't care either and willing buy into this knowing they are being fleeced. Why is that a flaw? While I certainly would welcome any of the post movie crew for my collection, the pre-86 cars were all "real vehicles" that the automakers should certainly be expected to want their cut of whatever marketing efforts are out there. Saying they "don't care" doesn't hold water since they made Ultra Magnus, Hot Rod, Star Saber and Shockwave in the midst of all the licensed vehicular mode Autobots. I can't agree that they "don't care" when the quality and engineering of the toys are superb and they exhibit slavish devotion to a 34 year old cartoon. They might be accused of caring too much. I do agree that they could certainly stand to make some of the guys you mention, but that's not going to stop me from wanting a full set of 84-85 cast members (like Blaster, who they've technically made one of the cassettes of). If they go this route with Bumblebee, it could extend to Cliffjumper and really, the rest of the mini-bots who won't have to bear the excess overhead in terms of licensing agreements. So many G1 characters, so many movie characters, and here I am just waiting for Masterpiece Terrorsaur. It's a flaw because they are only doing this to benefit themselves. Sunbow Masterpiece figures will be cheaper to design and produce with people blindly lapping them up for whatever prices they choose. Win-win for them. Ultra Magnus was the "second" figure in the MP line. MP-22 exists because of that. A logical upgrade, from palette swap to legitimate release. Hot Rod/Rodimus Prime are a lone anomaly within this line. Shockwave in the midst of all the licensed vehicular mode Autobots. Huh?? This line isn't all generic car bots though. The goal was to replicate the seasons of the show. A large chunk of the season one and two Decepticons will not be made within this line, as they are combiner teams. 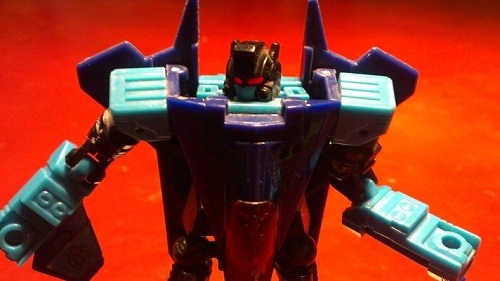 Shockwave was part of the very limited roster of early Decepticons that are not Gestalt. 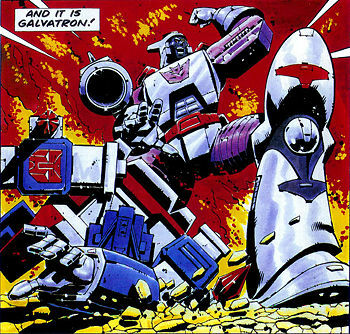 Apart from the fact Shockwave is a Gun Bot like Megatron, with a lot of the same functioning design to his mold. Not quite as blatant a palette swap as the Seekers but the same engineering was at play. There has been only one Dinobot in ten years. All of the others would be smaller and cheaper to produce. They chose not to. They continue to do so, and keep this G1 side of the MP line stuck in indefinite limbo. Hiding behind licensing "barriers". Nemesis Maximo wrote: So many G1 characters, so many movie characters, and here I am just waiting for Masterpiece Terrorsaur. The Beast Wars MP Line is six figures strong. 4 of 14 of the season one cast. Roughly 30% complete within 3 years, plus two redecos. The grass is definitely greener for the BW fanbase. AllNewSuperRobot wrote: It's a flaw because they are only doing this to benefit themselves. Sunbow Masterpiece figures will be cheaper to design and produce with people blindly lapping them up for whatever prices they choose. Win-win for them. Where's the proof of your assertion? Just that the figures aren't made? It seems you are more just kind of angry at Hasbro/Takara than basing your argument on anything that has been said by them. Again, as a fan, I do agree with you on figure selection to a degree. The MP+ stuff has slowed the line down to a large degree, and rabid Gee-Wun person I am, I still don't want to re-purchase figures I already bought. Much rather buy new ones (even if my shelf cries out for me to stop). Your point about one Dinobot, though - because he's not scale, Grimlock would likely need to get remade, anyway at this point. I still think this is probably the way we end up with the mini-bots many of us have been waiting for. And maybe even Mirage and Trailbreaker / Hoist. We'll see, I guess. Shockwave has nothing engineering-wise in common with Megatron. Do you have the figures, because I do, and I don't see that at all. Gun =/= Gun. Last edited by sol magnus on Tue Feb 05, 2019 10:53 am, edited 1 time in total. Apologies, typos and all that. I would rather have a Rodimus Prime 2.0. but I would much rather have any other transformers not 2.0. galvatron, cliffjumber, hound, mirage, insecticons, jazz, reflector, the tripple changers, ANYTHING that is currently missing from the masterpiece line. And here I was hoping for some news about the OTHER minibots. I realize this Bee 2.0 is just a rumor so far, but lately I’ve been thinking about just how much I’ve wanted to see MP Gears, Huffer, Windcharger, Cliffjumper, and especially Brawn. The smaller bots make their larger teammates look all the more impressive. I’m not even going to get into just how ridiculous these increasing prices are. I already cancelled my MP BW Megatron, because there’s just no way I’m going to be able to afford it, no matter how much I want it. And I don’t even know how much Hound is going to wind up costing. If I had to guess as to why Bumble would be the next one chosen to get a redo and done so soon after Convoy, it's probably a tie-in to the still forthcoming Bumblebee movie release for Japan, which would be out around the time of this figure's official announcement. I thought that too. The boost in Bumblebee's profile is entirely down to the Live Action Movies choosing him as the mascot. Arent we much higher than that for the ark crew and initial decepticons from season 1 of G1? The only missing decepticon is reflector. The difference being the time scale. Beast Wars Season One is 30% approx complete from 2016 to 2019. How many years did it take for Sunbow Season One to reach the current level? One thing to take into consideration is how long it took fit the line to fall into a fairly consistent release pattern. I really hope this is false. There's so many other characters that deserve a shot. Bumblebee has a great toy already. I mean seriously, after that overpriced Prime 3.0 this is getting ridiculous. Well, might be, if it turns out to be true. Gimme Hound!